Last month we featured some items from the programme for the Boxing Day match in 1976 (actually played on the 27th as Sunday matches weren't yet allowed.) 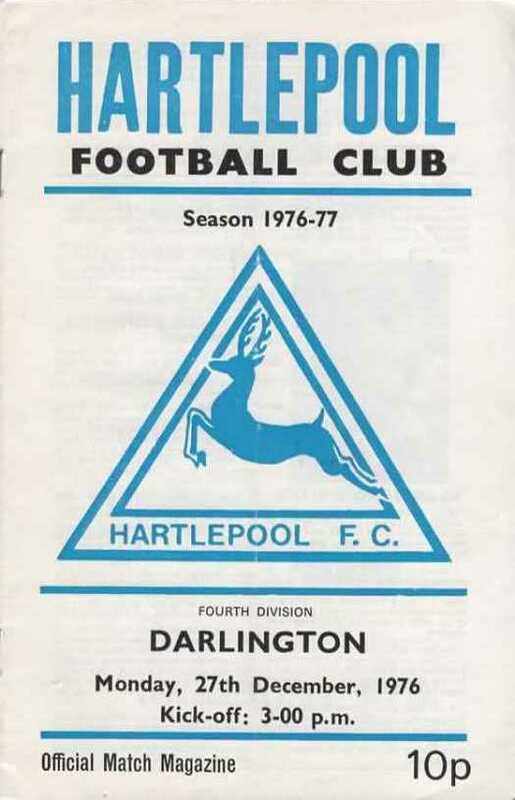 With this year's equivalent not having yet seen the light of day we thought we'd show the cover from 39 years ago, which demonstrates how simple Division 4 programmes were - the concept of the match-day magazine was yet to reach Division Four, even though the cover suggests otherwise. It also shows how cheap they were, at a mere 10p. The club badge of the day figures prominently. While many clubs use a shield as part of their badge, or a circle to represent a football, there can't ever have been too many triangular ones, and this one didn't last too long. The whole thing is letterpress-printed in the old-fashioned way that William Caxton would have recognised 500 years ago (if he hadn't already been dead for 20 years by then, that is!) - lots of little metal letters assembled by hand into a frame which is then used in a printing press to transfer ink onto the paper. Look at the 'A' in 'Hartlepool', which is not fully formed (the typesetter may have set it too far back for the ink roller to reach its edges), and the 'T', which is set slightly higher up the page than the adjacent 'R' and 'L'. So, while we can't say whether we'll see the same fixture being repeated at some future date, we can say that the programme for it will be a bit slicker than this.